A few weeks ago I read this article by Allison Tate and I haven't stopped thinking about it since. I am not alone, I keep seeing links to this article and hearing other moms talking about it all over the place. When I think about the article, I think about my own mom. She hates to have her photo taken. So much so that there are very few pictures of her in existence. There is one that I came across a few years ago of her standing in a room with a big smile like someone told her to say cheese. She is probably about my age, she looks a little tired and she is clearly picking up the room, since she has an armful of stuff. I loved looking at this picture, now as a grown-up and thinking back to what my mom's life was like when she was my age. When I was a kid, she would get out of the picture mumbling something about how she looked and saying she just wanted a photo of the kids. I never really got what she was talking about until I became a mom. The all of the sudden I got it. I was carrying a few extra pounds, I wasn't necessarily showering everyday and most of the time I left the house without looking in the mirror (I just want to say even though I wrote this in the past tense all these things still apply today.) I was definitely not feeling my most photogenic. Fortunately for me I am most often the photographer, so it was pretty easy for me to stay out of the picture. 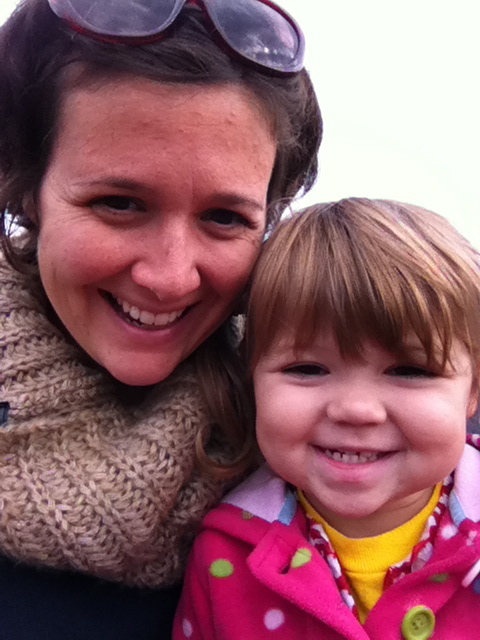 Then a few months ago, the Bee needed a photo of her and I and the only one I could find was from her first birthday. I felt terrible, like I hadn't been a part of her life for the last three years. I know this is silly, I spend everyday with her, so it is obviously not true. However there was no evidence of the time we spent together. There was no reminder for her to look back on that I was in the picture with her. So I am making a big effort these days to get in the picture. This mostly means I hold the phone out at my arms length and turn it back on us but at least it will be a reminder for the both the girls and I to look back on in the future. Not only just to remember the moments, but so we can remember what we were like together, so I can remember what these days were like and so that they can someday see what it was like for me to be the mom. It's a gorgeous picture. I'm the same, and am having to make a conscious effort to embrace the camera. I saw that post too, and it also resonated with me. This is a BEAUTIFUL photo of you two, and one that I'm sure you'll both treasure for years to come. Thanks for the reminder.